(a) Remove the 4 bolts and 2 compression springs. (c) Remove the 2 gaskets from the exhaust pipe front and exhaust pipe center. (a) Disconnect the pump module connector. Push the connector deeply into the charcoal canister to release the locking tab. (e) Remove the 3 nuts and charcoal canister. 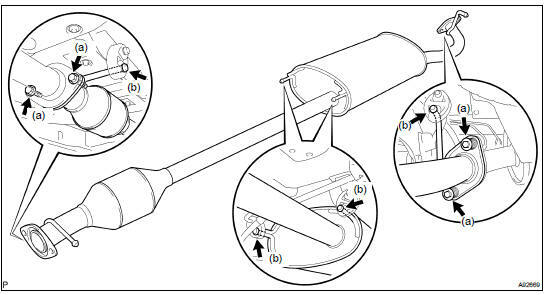 (a) Install the exhaust pipe center to the 4 exhaust pipe supports. (c) Using a vernier caliper, measure the free length of the compression spring. (d) Install a new gasket and the pipe center to the pipe tail with the 2 bolts and 2 compression springs.